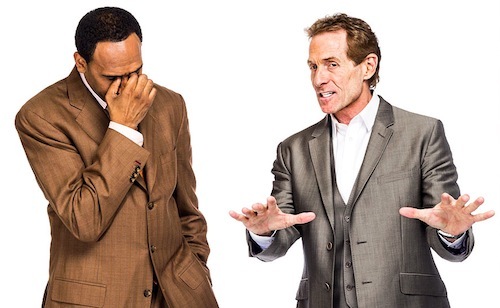 The last time I wrote about Skip Bayless opening his mouth, it was easily up there with some of the most insane things he's said. Thankfully this time, he said something that I think most people, at least in Boston, would agree with. He said the Patriots have basically blown everyone out of the water this offseason. “In all my years, I have never seen anything quite like what just happened over one week’s time with the New England Patriots. Let’s get this straight. The defending Super Bowl champion, the winner of two of the last three Super Bowls, the winner of five Super Bowls in the Tom Brady era just won the offseason. It has no doubt been a really fun offseason for the Pats. They just re-signed Dont'a Hightower the other day, traded for Brandin Cooks and Kony Ealy, and signed Stephon Gilmore, Lawrence Guy and Rex Burkhead. They're acting like a team that just got destroyed in the Super Bowl rather than a team who won it. Bayless doesn't even think other teams should try against New England next season. While the cocky Patriots fan in me agrees with him, the rational Patriots fan in me says we should pump the brakes just a bit. Yes, no doubt all these moves make them better than last year, especially if they can keep Malcolm Butler around for at least one more season. But of course, you've got to assume key players stay healthy and the team plays up to their capabilities. The latter is very likely to happen, the former is always an uncertainty. Not to mention the Patriots' schedule is more daunting than it was last year. The knock on them last year, albeit pretty silly, was that they didn't play any good quarterbacks outside of Russell Wilson until they got to the AFC Championship game. This year, the Pats will face a litany of very good quarterbacks in Ben Roethlisberger, Cam Newton, Drew Brees, Matt Ryan, Derek Carr and so on. I'm not saying I think they'll lose any of those games, but what I am saying is it's premature to assume they'll run through their opponents like they did last season. They should win anywhere between 12 and 14 games in the regular season and have the best chance of anyone in the AFC to get back to the Super Bowl. And if they win a sixth next year, they might just be considered the greatest franchise in NFL history.